JEB clients store the JEB engines configuration, also known as the back-end configuration, in the bin/jeb-engines.cfg. The configuration file is a key-value store where keys are fully-qualified identifiers that start with a leading dot. This file contains general back-end settings as well as the settings of common plugins shipping with most distributions of JEB. Each plugin has its own sub-namespace (.PluginType) within the .parsers namespace. Keys pertaining to document rendering are stored in a sub-region named .text. The public keys can safely be changed by a user. They are accessible in the Options dialog, Advanced mode, panel Engines. 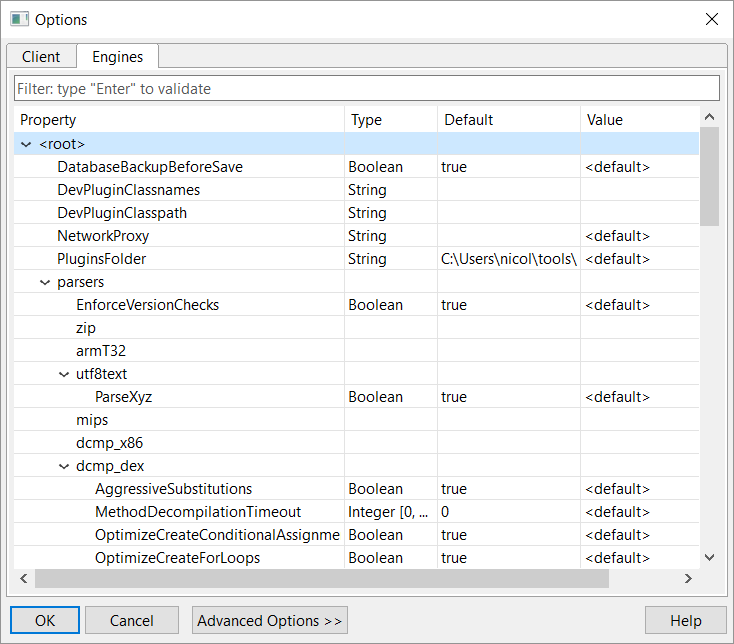 The engines configuration acts as a template for your projects' settings. Once a project is loaded, an additional tab named Project-Specific allows the user to modify the back-end settings of the project only, without changing the global back-end settings. Description: Before saving a project to JDB2, the current JDB2 database is copied to the %TEMP% folder and will be used as backup is any problem showed up during saving. Description: If the standard analysis yields more routines that this provided threshold, then the user will be prompted for confirmation before starting the optional advanced analysis pass (and subsequent passes). Description: The advanced analysis is an optional analysis pass that comes after the initial standard analysis. It permits discovery of indirect dispatch, therefore providing better routine discovery coverage, and partial resolution of register values. Locations are architecture- and code object- dependent and may be customized via environment variables. Refer to the manual for additional documentation. Description: Global analysis passes are optional passes provided by specific decompiler modules. They may allow recovery of complex artifacts, such as classes or modules. Description: For raw formatting, determine the maximum number of bytes per line in gaps and slack spaces. Must be a power of 2, else reverts to the default. Description: Prefer the use of LLDB server over GDB server for debugging native Android code. Description: Preferred GDB server version to use. JEB does not ship with all versions of GDB server for all platforms. See the core/assets/ folder in your jeb.jar software archive.It is recommended to use the default. Description: Preferred LLDB server version to use. JEB does not ship with all versions of LLDB server for all platforms. See the core/assets/ folder in your jeb.jar software archive.It is recommended to use the default. Description: If the client does not provide this information, this setting is used to determine whether the native debugger should be used as well. Use DEFAULT to let JEB choose (which will result in a yes if and only if a native library folder containing SO files exist), else use ALWAYS or NEVER. Description: Disable aggressive IR optimization pass, normally scheduled to run in later IR lifting stages. This pass is used to remove unused out-reaching variables. Description: AST optimization: attempt to create try-(catch,multi-catch)-finally blocks. This heuristic is potentially unsafe. Description: AST optimization: attempt to create switch-on-strings. This heuristic is potentially unsafe. Description: AST optimization: attempt to create synchronized blocks. This heuristic is potentially unsafe. Description: CSL of well-known packages that may not be provided as fully-expanded in code hierarchy tree documents. Use * to prevent auto-expansion for all packages. In practice, the JEB UI client will not auto-expand those packages by default to avoid cluttering the code hierarchy fragment view.